The Sherlock Holmes stories by Sir Arthur Conan Doyle were recently voted as the top mystery series of all time, and they have enthralled generations of readers --- and writers! 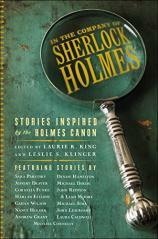 Now, Laurie R. King, author of the New York Times bestselling Mary Russell series (in which Holmes plays a co-starring role), and Leslie S. Klinger, editor of THE NEW ANNOTATED SHERLOCK HOLMES, have assembled a stellar group of contemporary authors from a variety of genres and asked them to create new stories inspired by that canon. Readers will find Holmes in times and places previously unimagined, as well as characters who have themselves been affected by the tales of Sherlock Holmes. The resulting volume is an absolute delight for Holmes fans both new and old, with contributions from Michael Connelly, Jeffery Deaver, Michael Dirda, Harlan Ellison, Denise Hamilton, Nancy Holder, John Lescroart, Sara Paretsky, Michael Sims and more. The game is afoot --- again!